Bodybuilding involves workouts designed to maximize muscle hypertrophy. 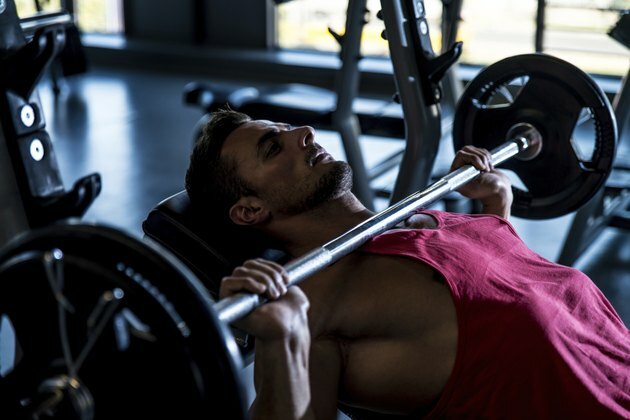 For the best results, most bodybuilders will follow a strict nutrition plan with additional supplements such as protein, post-workout recovery drinks, fat burners and even fish oil. Fish oil supplements contain essential fatty acids that play an important role in overall health, but also provide added benefits to bodybuilders. Choosing the correct dosage for fish oil, however, requires deliberation. A bodybuilder's diet consists of specific amounts of each macronutrient -- carbohydrates, protein and fat -- to maximize training results and muscle size. Fish oil helps provide the correct amounts of essential fatty acids that complement the nutrients from the whole grains and lean protein. Fish oil supplements contain essential fatty acids, including docosahexaenoic acid and eicosapentaenoic acid. The nutrient label on the supplement typically displays the total amount of fish oil per serving along with the individual DHA and EPA content. You will use the DHA and EPA content information to determine the amount of fish oil to take. According to the World Health Organization, most healthy adults should consume 0.3 to 0.5 grams of EPA and DHA per day to maintain proper health. Bodybuilders, however, require additional fish oil because of increased body mass and activity levels. A specific fish oil calculator can estimate the amount of fish oil based on body mass, diet and current health status. For example, a healthy, 200 pound bodybuilder who is getting adequate rest and consuming a balanced diet would need to consume eight pills per day based on a supplement that provides a total of 1,300 mg of fish oil. Consuming the appropriate amount of fish oil provides several health and performance benefits for a bodybuilder. Following workouts or training sessions, the body suffers from cellular damage and tissue inflammation. The polyunsaturated fats in the fish oil provide the nutrients necessary to rebuild the cell membranes while reducing the inflammation in the joints and muscles. Along with rebuilding cell membranes, fish oils have been linked to improved cardiovascular health and immune system function. Always consult professional advice from a physician or registered dietitian before starting a bodybuilding training program or using a fish oil supplement. They can make additional suggestions on the amount of fish oil based on your body size, activity level and health status.